Previous European legislation providing competitors with equal access to infrastructure still stymies Gazprom's expansion into the European market. The Road Map promises support for such large-scale projects of mutual interest. According to the terms of the Road Map, by 2020 Russia and the EU will provide support for large gas infrastructure projects which the two sides designate as projects of mutual interest. By 2030 they will harmonize market regulation, and by 2050 remove all barriers in the oil industry. Currently, Europe is the destination of 70% of Russian gas exports. The Road Map obliges the EU to inform Russia about any changes in demand for natural gas or measures to reduce the use of hydrocarbons. The Third Energy Package guarantees equal access to infrastructure, and consequently, is Russia's biggest strain on energy relations with the EU. To ensure equal access a supplier is faced with either selling off its transit assets, appointing an independent operator, or allowing competitors access to up to 50% of those assets' transit capacity. A Gazprom representative has refused to comment on the Road Map. Russia wants the EU to grant special status to Gazprom projects: the North Stream, with the NEL and OPAL spurs, and the yet to be built South Stream. Nicole Bockstaller, a representative of the EU Energy Commissioner, previously stated that exemption could be given to pipelines that cross the territory of two or more countries. One such exemption has already been made for OPAL, which connects Germany and the Czech Republic: Gazprom has been allowed to reserve more than 50% of the pipeline's capacity, provided that it supplies at least 3 billion cubic meters of gas to the Czech market. As for NEL, the entire pipeline is on German territory. If the North Stream and the South Stream are designated as "projects of mutual interest," Gazprom could establish monopoly on using the two pipelines. But a source close to the European delegation says that the Third Energy Package can't be ignored and all Russia can do is pursue bilateral discussions on individual aspects of that package. The source says that Europe hopes for reciprocal steps from Russia; it wants the Russian energy market to become more open. Konstantin Simonov, head of the National Energy Security Foundation, believes that the energy discussions between Russia and the EU have reached a dead end. He explains that the Road Map does not contain any firm obligations, and the real steps the two sides are making belie their declarations. In mid-March the European Commission refused to put the South Stream on the list of priority projects. 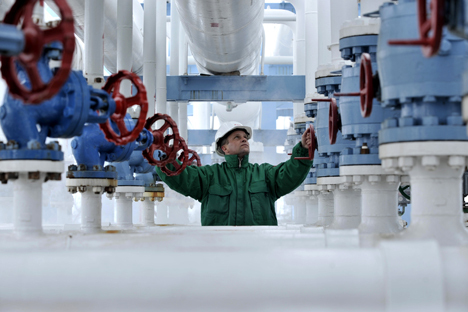 The expert adds that the EU believes harmonizing regulation must translate into breaking Gazprom's monopoly on gas exports - an unrealistic expectation.